Fine. Stick An Xbox 360 Inside You. You'll Be Malfunctioning Within A Day, You Near-Sighted Scrap Pile. 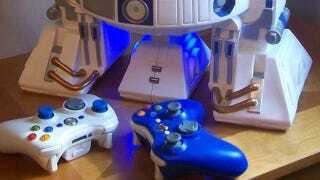 If you've got the room (and love for Star Wars) to spare, Major League Mods are selling these custom Xbox 360 consoles that stick one of Microsoft's machines inside a model of R2-D2. It's not cheap—like, it's $1300 ($1000 if you provide the Xbox)—but hey, console centrepiece showcases don't come cheap. For something a little cheaper, may I suggest this NES version, which "only" costs $500?